Been trying to get the tweaker coordinates for the 2018 cars. 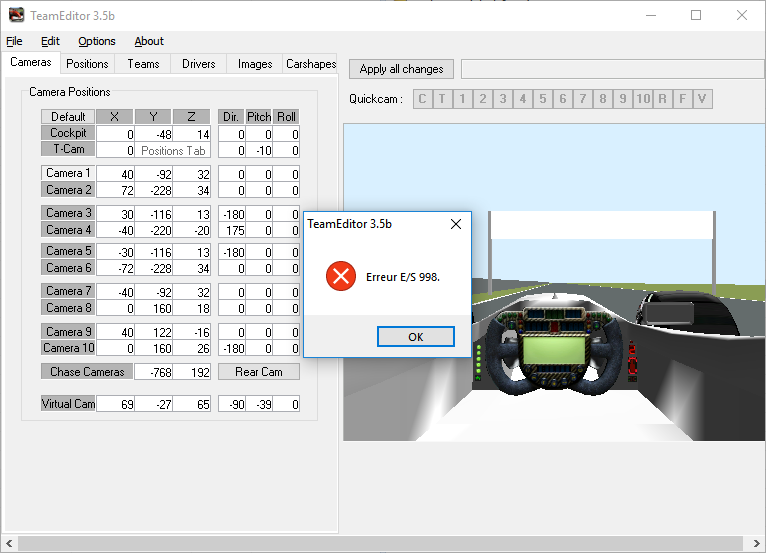 After inserting the carshapes into the wad, I get this error message when trying to switch to quickcam 1. Happened with the Ferrari and Mercedes, yet to try the other cars. Happends to me as well. Carshapes are so heavy. Managed to grab most of them now by continuously trying, error seems to pop up at random, not a specific car. 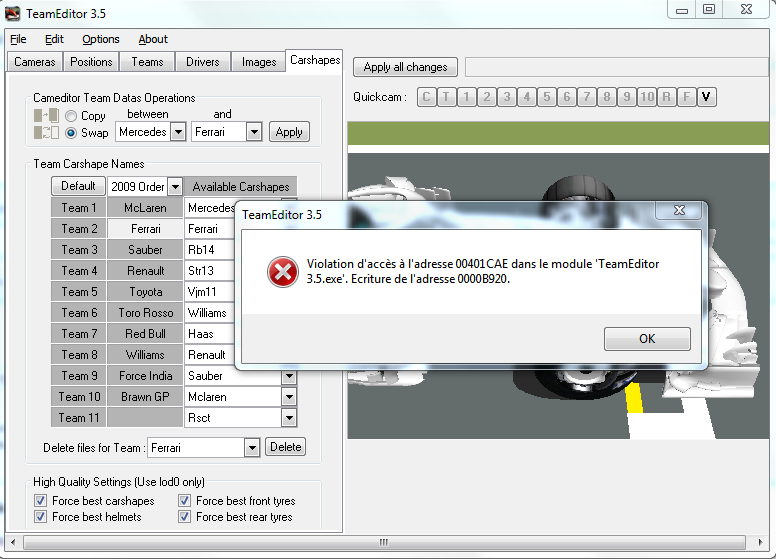 I have got a runtime error 216 at 00403E72 randomly but always when I change the team from the carshape tab in V or Tcam view , probably due to the weight of the lods_0 which are loaded by TeamEditor. It is right to say that the cars are heavy...but always into the GP4 limits in terms of Vertices/ Faces (65535). I hope that the cars will be a bit lighter with the 2019 rules and less aero parts. Strange that I had this problem more often recently. I didn't change my cars.wad and always under Windows 7 (x64) . Just a new updates for my CG and windows security updates. That's all. I am trying over things to fix this problem. But I am quite sure that E/S 998 and runtime error 216 at 00403E72 have the same cause. Pareil Excalibur, j'ai ce problème là depuis 2-3 jours quand je veux régler la t-cam et les positions du casque et volant. @bencoull: Interesting that you have the same problem since a few days, too... Did you modify something into your cars.wad recently? Did you find the origin of the problem Excalibur ? Yes. I tried with the original gp4 cars.wad and I have got no E/S or runtime error anymore. So, I guess that the problem occurs with heavy lods. The solution may be to make a cars.wad with lower lods (only lod_1 or lod_2, for example) just for TeamEditor. 5- Set your cameras and others positions as you wish but Don't click on the apply button! Edited 1 time(s). Last edit at 08/10/2018 06:01PM by Excalibur.